JDP offers the complete range of rainwater harvesting systems. Rainwater harvesting is not a new concept. Only recently have the benefits been recognised now that mains water supplied from the tap has become a much more precious (and restricted) commodity. The system works by taking the rain from your roof gutters, filtering out leaves and debris and storing the water in an underground tank. The water is then pumped into the house to be used for non-potable applications such as toilet flushing and washing machines. If the tank runs empty, the system switches to mains supply. There are two system options Gravity or Direct. The size of the holding tank for either of these systems is determined by the specific site requirements. Together with our partners JDP can offer a solution to suit these precise needs. 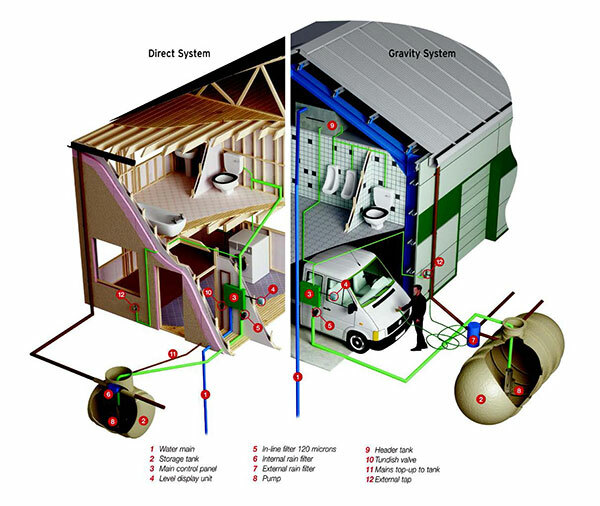 The Gravity System is ideal for domestic applications. The main advantage of this system is that in the event of power failure or rain stocks running dry, the system will automatically switch to mains water supply to ensure continuity of service. The Direct System is used where it is impractical to have a header tank, therefore water is pumped straight from the underground holding tank to the various appliances. The main advantage of this system is that rainwater is delivered to the appliances at mains pressure (3.5bar). Easy to install, simple to maintain, automatic in operation; the domestic rainwater harvesting system has been developed to provide the homeowner with a 'fit-and-forget' system, ensuring an automatic supply of harvested rainwater. Designed to be as user-friendly as possible, the system utilises much of the existing pipework within the building. The main requirement being the installation of a rainwater storage tank (with internal pump), selected to meet the roof area's water catchment yield and household requirements.